Many people are wondering how these Reverse Mortgage Loans work and whether they are a viable option for them. They may have all of the equity in their homes and little savings outside the home. They need money to live on. Either they have to sell their home which they have lived in for many years or find another solution. Fortunately, Reverse Mortgage Loans offer another solution to moving, selling or renting a home. They can stay right were they are. They can avoid the stress of leaving the home they may have lived in for many years. Here is how they work! How Reverse Mortgage Loans work? A reverse mortgage loan is the opposite of a traditional mortgage that you might have on your home. Instead of making monthly payments, you use the equity that you have built up in your home to generate income that you can use for personal use, paying bills and other living expenses, or just going on a trip or for medical expenses. Many seniors have a lot invested in their homes in terms of equity. They can draw on this equity from their home by using a reverse mortgage. Monthly installments, based on repaying your existing mortgage first. 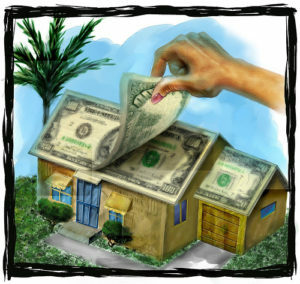 This is a financial option that may appeal to many homeowners who need money. As a result they would prefer to take advantage of this option instead of moving to an apartment or some other location. There are issues which people considering this option should take into account.